Ah Friday! I’ve missed you! It’s been another long, long week at work. Add to that my full complement of running days, plus a strength training session, and I am pooped. Tuesday all I wanted to do was watch TV and veg out after the gym. Instead, both cable and the internet was out. Wednesday was trivia night, Thursday we had to go grocery shopping. I’m skipping out on happy hour tonight because I’m just too exhausted, and I have a wedding to go to tomorrow. One cool thing I did do yesterday was make a new soup. I friggin’ love soup! Fairly easy to make, delicious, and stores very well. Make a big batch, eat some now, save some for tomorrow, and freeze the rest. 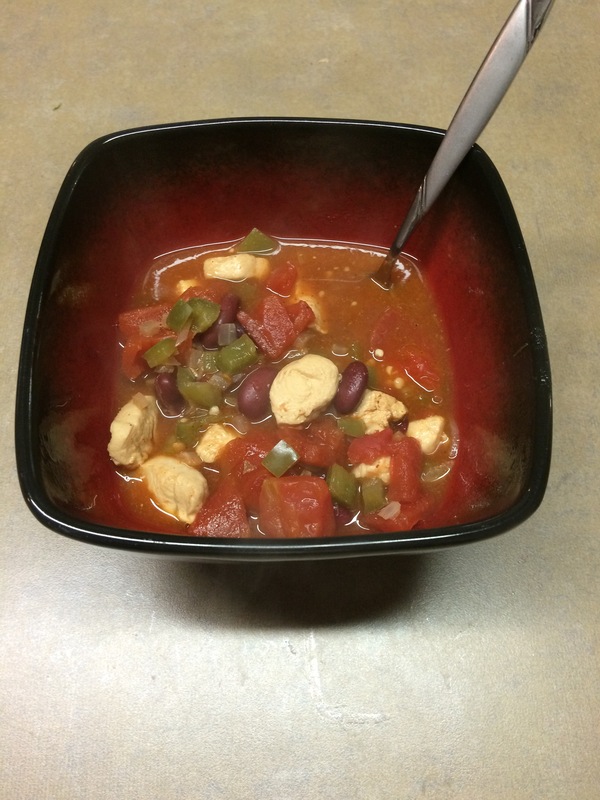 Last night I made spicy southwestern chicken soup. Chicken, kidney beans, green pepper, onion, garlic and seasoning. It came out very tasty, I was pretty happy with it. Ro, not so much; it was a bit too spicy for her! It also served as my lunch tomorrow, and likely a meal on Sunday too. Delicious and healthy, a great combination! This weekend on my training plan I’m supposed to do a 5k. I’m thinking about doing two miles of warm-up, running the 5k at just above goal pace around the park, and then a cool-down back. I’d like to finish up somewhere around seven miles on the day if I can. Does anyone do primarily bodyweight exercises? Or know of a good routine for when traveling? I’m heading out on a business trip for most of next week, and I’m trying to figure out what I should do. I’m definitely bringing my running clothes and hope to hit up a certain area on one of my trips. Hopefully pictures to come!